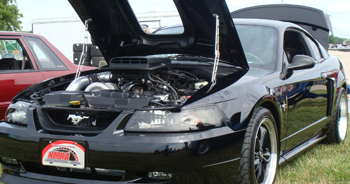 When Justin had to replace his 96 cobra, he chose this beautiful black 03 Mach 1 Mustang. He is very proud of his Mustang, and he has done all of the work on it himself! It even just won 1st place in his local NMRA/NMCA event! 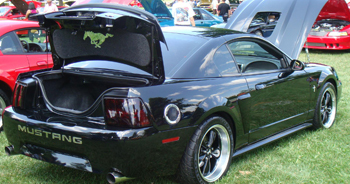 Among his extensive list of modifications are: 18 Black Bullitt Wheels, Complete UPR Products Rear Suspension, a Procharger 10PSI Supercharger System, a UPR Blue Thunder Shifter, and plenty of Dress Up Accessories! Congratulations Justin!